As New Jersey’s preferred locksmith, we here at Firstline Locksmith always seem to have locks and keys on the brain. We can’t help it, we love what we do. Because we’re always thinking about our work, we’re always thinking about new ways to share our work with our customers. That’s why we’re starting our new blog series “Think Like A Locksmith.” It’s a little bit like peering through a keyhole to look into a room. For our first entry into the “Think Like A Locksmith” blog series, we’ll talk about one of our favorite locks to work on: vaults! Today, we’ll talk about some cool vault facts that you might not have known! When we say the word, “vault,” it almost immediately summons the image of a heavy door in a secure location deep in the heart of a bank or building. But to discover the origin of the name of these secure spaces, you’ll have to look it up. Literally! Early strongrooms were often built in the basements of banks. These basements typically had vaulted ceilings. A vaulted ceiling has arched ceilings to help support the weight of whatever is resting on top it. Think of an old church or cathedral, and you’ll know what a vaulted ceiling is. There’s no doubt that vaults are tough. It’s one of the reasons the design has withstood the test of time. The modern bank vault, as we know it today, emerged in the middle of the 19th century. The California Gold Rush in 1849 saw thousands of prospectors and miners race into the state. Those unable to strike it rich by panning for gold turned to more illicit means and began robbing others. While commercial safes were an option then, they were often light enough for robbers to pick up and haul away from a bank. Vaults were designed to solve this issue by creating more massive spaces to store gold and other valuables. While simply making vaults larger solved one problem, every solution leads to more and better problems. Robbers began finding ways to break into these new, larger vaults. Robbers gained entry into early vaults by simply packing gunpowder into the door’s hinges and blowing the door off. Later, as bank vault doors became more complicated and stronger, robbers turned to nitroglycerin and acetylene torches to work open the vaults in new ways. Today, vaults are constantly being redesigned to address the ingenuity of criminals. It’s not uncommon for the most secure bank vaults to utilize heat, motion, temperature, and humidity sensors, all linked to silent alarms. Some vault doors weigh as much as 22-tons and are guarded by armed guards and robots. Despite these challenges, some ambitious criminals still find their way into these vaults. Bank vaults initially made use of combination locks, like their smaller safe counterparts. But these combination locks could simply be drilled through to access the lock’s components, opening the door through the interior of the lock itself. Enter inventor Linus Yale Jr. Yale put a new spin on the combination lock by adding a timing mechanism. This means that even if the combination entered into the lock is correct, the vault door still won’t open until a certain number of hours has passed. This kept robbers from coercing bank employees into opening the vault whenever they demanded. This same system, designed in the 1860s, is used today by many vaults. Movies often portray vaults as being packed floor to ceiling with stacks of dollar bills and bricks of gold. While, undoubtedly, there are vaults that look like this, some vaults hold much more than money. The Svalbard Global Seed Vault in Norway houses the world’s largest repository of crop seeds. The KFC corporation keeps the Colonel’s recipe for his secret 11 spices and herbs locked away in an advanced vault. The Vatican keeps a vault of secret Catholic archives in Rome. 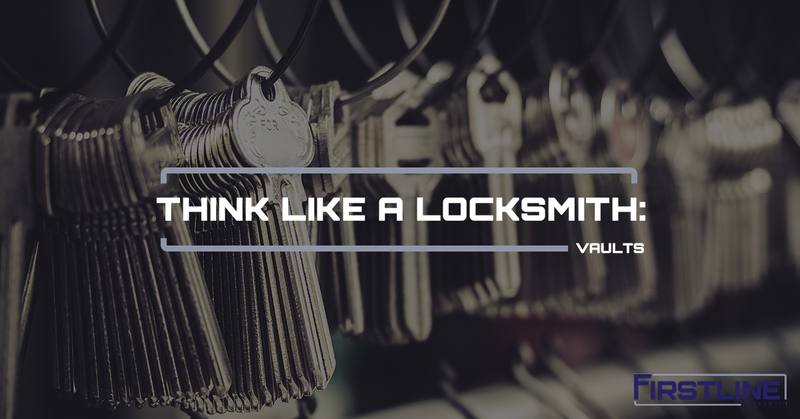 We hope you enjoyed the first entry in the “Think Like A Locksmith” blog series. We hope it gives you something to think about while you wait for our emergency locksmith services to open your house the next time you leave your keys on the kitchen counter. For all your locksmith needs in New Jersey, give Firstline Locksmith a call!